Lionel Messi celebrated the birth of his second son with a winning goal as Barcelona went top of La Liga with a 2-1 win at Atletico Madrid. Messi, who had not scored in Barca's first two league games, started on the bench after missing training on Friday to be with his new baby boy Mateo. Atletico went ahead six minutes after the break when Fernando Torres rolled in a shot, but Neymar equalised. 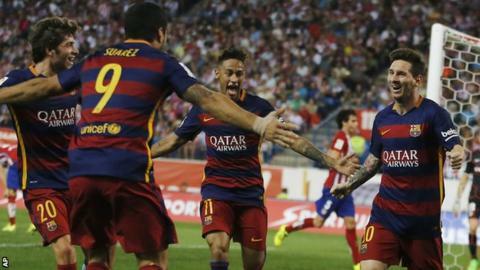 Messi then grabbed the winner after being set up by Luis Suarez. It was the Argentina international's 287th La Liga goal for Barcelona, extending his lead as the competition's all-time top scorer. His goal came on the day that Real Madrid forward Cristiano Ronaldo became his club's record league scorer - and moved up to fourth in the overall standings with 230 goals - by scoring five in a 6-0 win at Espanyol. Messi had scored in Argentina's 2-2 midweek draw with Mexico but was seeking his first La Liga goal of the season before Saturday's game. He saw Suarez hit the bar in a poor first half, before Atletico took the lead early in the second when Torres finished off a fine counter-attack. That lead lasted only four minutes, though, as Neymar curled in a stunning free-kick from 20 yards. Barcelona had a penalty appeal rejected when Atletico defender Diego Godin appeared to handle the ball, but Messi won the match with a stylish, low finish. Match ends, Atlético de Madrid 1, Barcelona 2. Second Half ends, Atlético de Madrid 1, Barcelona 2. Hand ball by Filipe Luis (Atlético de Madrid). Attempt missed. Lionel Messi (Barcelona) left footed shot from outside the box is too high from a direct free kick. Giménez (Atlético de Madrid) is shown the yellow card for a bad foul. Corner, Barcelona. Conceded by Yannick Ferreira-Carrasco. Attempt missed. Lionel Messi (Barcelona) left footed shot from outside the box is too high. Assisted by Neymar. Foul by Jackson Martínez (Atlético de Madrid). Attempt saved. Jackson Martínez (Atlético de Madrid) left footed shot from the centre of the box is saved in the centre of the goal. Assisted by Antoine Griezmann with a cross. Substitution, Atlético de Madrid. Luciano Vietto replaces Gabi. Corner, Barcelona. Conceded by Jan Oblak. Attempt saved. Luis Suárez (Barcelona) left footed shot from the left side of the box is saved in the centre of the goal. Assisted by Lionel Messi. Goal! Atlético de Madrid 1, Barcelona 2. Lionel Messi (Barcelona) left footed shot from the centre of the box to the bottom right corner. Assisted by Luis Suárez. Attempt missed. Tiago (Atlético de Madrid) right footed shot from outside the box is high and wide to the right. Offside, Atlético de Madrid. Gabi tries a through ball, but Juanfran is caught offside. Attempt saved. Yannick Ferreira-Carrasco (Atlético de Madrid) right footed shot from outside the box is saved in the centre of the goal. Assisted by Koke. Corner, Barcelona. Conceded by Giménez. Attempt blocked. Neymar (Barcelona) right footed shot from the left side of the six yard box is blocked. Assisted by Lionel Messi. Corner, Barcelona. Conceded by Juanfran. Jeremy Mathieu (Barcelona) wins a free kick in the defensive half. Attempt missed. Luis Suárez (Barcelona) right footed shot from the right side of the box is close, but misses to the right. Assisted by Rafinha. Substitution, Atlético de Madrid. Jackson Martínez replaces Fernando Torres. Corner, Barcelona. Conceded by Filipe Luis. Substitution, Atlético de Madrid. Yannick Ferreira-Carrasco replaces Óliver Torres. Substitution, Barcelona. Lionel Messi replaces Ivan Rakitic. Goal! Atlético de Madrid 1, Barcelona 1. Neymar (Barcelona) from a free kick with a right footed shot to the top left corner. Neymar (Barcelona) wins a free kick in the attacking half.